If you’re looking to buy your first ever inflatable air mattress, the abundance of brands, features, and options to choose from can make it a rather complicated decision to make. Alternatively, if you’re looking to replace an existing one, again, there is so much choice from different manufacturers you may find it hard to narrow down the right model and find the best air mattress. To aid in your decision-making process, we have put together this useful buying guide and air mattress reviews, which includes the essentials to help you understand all the options and terminology involved in this vast field. Also commonly referred to as an air bed or sleeping pad, they are literally a PVC blow up mattress which is filled with air instead of memory foam, latex or springs. They could be low profile, raised (also known as double high), or placed on a stand. Some even come with legs. There are different ways of inflating them, but usually, it’s with an electrically powered pump or something similar. They generally tend to have a higher owner satisfaction than an innerspring, but not quite as high as latex or memory foam. Some people prefer to sleep on inflatable air mattresses because of the advantages they have such as adjustable comfort levels which is great for back pain relief. Also, both sides of a blow up bed can be customized to different levels of firm or soft which is great for those who share but have different preferences. An inflatable mattress can come in all different sizes, ranging from the smallest Twin size all the way up to King. Unlike a heavy innerspring or memory foam, the portability of adjustable air beds means many different scenarios where they could be used, and so makes it one of the most appealing selling points. You can easily blow up and leave it to be used as a permanent bed for you and your partner, or it could be deflated and packed away ready to be used as a guest bed. Alternatively, if you buy a sleeping pad, you can use it for outdoor trips which easily fit inside your tent instead of using a sleeping bag on a hard surface. The flexibility and affordable prices make inflatable air mattresses as a whole a very popular household item in many countries across the globe. Although air mattresses are generally portable, you can use them as permanent beds which aren’t packed away in storage but are left out for every night use. They tend to be more expensive than the smaller low-profile guest beds and sleeping pads, and are available in large sizes such as Queen and King. Some already come on their own raised platform or can be placed on a separate purpose-built stand. Air mattresses can be great permanent beds for people who suffer from types of back pain or for those who are looking for a sleeping surface that can be adjusted to their needs as often as necessary. There are many durable options, some of which come with built-in pumps so keeping them inflated over time is as quick and easy as changing the sheets. A smaller Twin or Queen size can be ideal for temporary usage. You can set them up almost anywhere in your home quickly, then deflate and stow them away once they are done being used. Take it to a sleepover or have people come to visit. The flexibility and compact-ability of a small air mattress mean comfortable sleep instead of a hard floor or uncomfortable sofa. Many varieties come with built-in pumps to inflate, and power deflate options as well, so setting up and taking down has never been simpler. Nowadays for just a small chunk of change, you can buy top rated air mattresses that serve as perfect guest-bed solutions regardless of the space you have available. With proper care, one of these can last a lifetime and is easily packed away in the closet or other storage areas when not in use. Have you ever had to sleep in your car? It probably wasn’t a very comfortable or good night of rest, right? Maybe you’re planning a road trip and don’t want to pay the hotel costs every night, but worry about your comfort if you sleep in the car again. Well, you’re in luck; an inflatable car bed is an excellent way of getting sound sleep in the back of any vehicle. Inflatable car beds come in many shapes and sizes, from large varieties that fit in the back of an SUV, to small options that will fit in the back seat of your sedan. Backseat options come with custom stands or shaped with inflated feet that sit in the rear foot-wells, which support the edges when fully inflated. The snug fit maximizes back seat surface space to make room for the sleeper. These portable mattresses offer plenty of room for one or two people to comfortably sleep for the night. Camping is a great experience, but sleeping on the ground with just a thin layer of a sleeping bag or foam pad beneath you is not for everyone. Because of this, many people have begun to take some advanced kind of sleeping equipment when they are out camping. There are plenty of comfortable and affordable alternatives to thin sleeping pads in the form of camping mattresses. You can comfortably fit a Twin size inside a small tent and up to a Queen size in a larger tent. These purpose-built camping mattresses can be inflated using the DC port in your car or manually with a foot pump, and when you’re done with it in the morning or at the end of your trip, it can be rolled up and left in the trunk or easily fit into a backpack for hiking. There are so many factors to consider when choosing the right one. Not only brands, but numerous options exist such as raised height or low profile. There are various pump options too; do you need an external manual foot pump or a built-in automatic electric pump? Before you make any type of purchase, it’s good to know the pros and cons, comparable features, price brackets and types that exist too. In this section of our air mattress reviews and buying guide, we discuss the things you’ll want to consider or especially look out for when deciding on the best inflatable mattress for your needs. As you will see from our reviews below, not all are created equal. To begin with, we will discuss eight common varieties to give you more insight into the types that are available to you. An air mattress will be considered heavy duty if it is made from high quality, puncture resistant fabric. Also, if it features some kind of leak locking technology or leak proofing in the pump. Additionally, if it is made to be used for long periods or in rugged outdoor environments, without suffering from the wear and tear that most low-quality cheap air mattresses would incur, this would also make it classed as heavy duty. If all of these things, or some combination of them, are true, then the mattress is heavy duty. 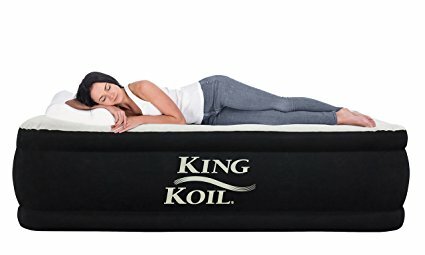 These are going to be the longest lasting and most likely the best air mattresses on the market, although that doesn’t mean they will come with all of the bells and whistles available on other types listed here. Heavy duty air mattresses are best for camping or those who want to use their purchase as a permanent solution in their homes. Many of the air mattresses on the market today with built-in pumps are considered automatic or self-inflating. These are great because they allow you to flip a switch and walk away knowing your inflatable mattress will automatically be perfectly filled when you return. The pumps on self-inflating air mattress are either battery powered or plug-in. Battery powered models are usually rechargeable rather than requiring new batteries every time. There are a couple of types of self-inflating air mattress. The first type allows you to choose your firmness setting, typically plush, medium, or firm. The second type inflates it entirely, without giving you a choice in firmness. This kind is slightly less desirable, but can usually still be adjusted manually after it is inflated fully. Part of the appeal of inflatable air mattresses is their portability; however, not all are easily traveled with. The weight will be a significant factor in whether or not an air mattress is portable, but that is not the only factor to consider. Some come standard with bases that are necessary for use, making them far less portable than others. The weight of an inflatable air mattress is the most significant factor in its portability, however, so it’s something to pay extra attention to. What may be easy to travel with for one person might not be carried comfortably for another. Inflatable mattresses can range in weight from around 15lbs to around 50lbs, so there is a large weight difference to consider when purchasing. These days blow up air mattresses can be just about as luxurious as your high-end pocket sprung or even some of the best memory foam mattresses. Automatic inflation to your perfect level of firmness, pillow tops, memory foam accents, and even built-in pillows are just some features available on luxury air mattresses. The most luxurious options are typically available on the high-level raised air mattresses, although that is not always the case. Some low-profile types also have luxury features available, but usually not as many as their raised counterparts. One of the most luxurious is the SoundAsleep air mattress range, (which you can read more about below in the air mattress reviews). Regardless of brand, most blow up mattresses now come with fantastic features that are suitable for anyone’s individual wants or needs. A blow up mattress is a great, inexpensive alternative to a regular bed in your home or a good way to keep guests off of uncomfortable floors and couches. As long as you don’t need the high-end luxury features available on today’s options, you can get deals on low-cost air mattresses that will last a long time and are quick and easy to store. Cheap air mattresses tend to have external pumps, rather than pumps that are built-in. The least expensive versions will usually come with manual hand or foot pumps, saving you money on batteries or electricity as well. These types are not for everyone since they do require more time and energy to inflate, but they are great for their price tag and typically do not lack quality. From the most feature-packed to the most inexpensive, electric air mattresses are all over the market these days. These are fantastic options if you want to be able to choose your firmness, flip a switch and walk away while your blow up mattress inflates or deflates, or you are looking for an airbed that will maintain its air pressure overnight. Electric air mattresses are ideal for in-home use, especially for those interested in using as a permanent setup in their home. The downside to electric air mattresses is that they aren’t usable in all situations, like camping or hiking. One of the benefits of an inflatable mattress is its portability, and needing electricity to power it, although often okay, is sometimes a deterrent to an airbed’s ability to be traveling with. We often think of an inflatable mattress as less comfortable than our everyday beds because of the lack of cushion on them, but that doesn’t have to be the case. Many inflatable air mattresses are now available with pillowtop options. Some are permanent, and some can zip off for easy cleaning and storage. The pillow tops range in softness and thickness as well, so you can be sure to find just what you need to achieve your best night’s sleep. Only the more luxurious, pricey and usually the best air mattresses will offer pillowtop options, so be aware that shopping on a budget may deter you from buying one of these. However, as they gain popularity, they are becoming more and more mainstream, and easier to find at lower prices. Manufacturers try their hardest to produce portable air mattresses that mimic standard sizes for beds so that consumers can easily fit standard sheets. Although air mattresses most commonly come in Twin and Queen size, they are sometimes also available in Full, Single, and Double. Let’s take a look at the dimensions of each. Please note that these dimensions do not include height as that can vary based on whether you choose a low profile or raised. Raised air mattresses range in height from 16” to 22”, regardless of the size of the airbed. Low profile mattresses are anywhere from 7” to 10” high. Air mattresses come in different heights or thicknesses, but most commonly these are raised for ease of access. Raised air mattresses are generally around the same height of a typical mattresses and box spring combo’s. They are simply inflatable mattresses adjoined to their own platform. They are designed to keep users further off of the floor and offer a more traditional sleeping experience than low profile models. Since raised inflatable mattresses are much easier to get in and out of, they are ideal for older guests or those with mobility issues. These are also great if you are using them in an area where the floor or ground is cold since they will keep you further away from the less-than-ideal temperatures. The slight disadvantage is simply to the size. They take up more space than low-profile models when packed away for storage, and are more difficult to use in a tent or other outdoor scenarios. Thinner, or low profile, air mattresses are made without the added base that comes standard with taller models. This lack of base typically means that they are slightly cheaper and more compact than raised air mattresses. Low profile mattresses are ideal for trips as they can be easily deflated, rolled up and packed away into your car or backpack when not in use, and they are not too large to fit into a small tent. Low profile air mattresses are similar in usability, size, and price to a folding floor mattress, but are much more compact when it comes to packing away, and typically far more comfortable. Since these easily portable mattresses are small enough to store in tight spaces when not in use, they are ideal for apartment dwellers as well. Low profile models are no less high tech than their raised counterparts, so you will not have to worry about giving up the luxury of an internal pump or automatic deflating just because you opted for a low profile mattress. There are two types of pumps that can come with an inflatable air mattress, one is external, and the other is internal. The external pumps can differ in how they are powered. They are typically either manually powered, battery powered, or plug-in. Air mattresses that require an external pump are usually slightly cheaper than those with built-in pumps, making them a good financial choice. Since the pump is not connected in any way to the body or base, it can more easily be misplaced, and if that happened, you would then need to purchase a new pump to inflate your blow up mattress. On the flip side, since the pump is not attached, it can be used to pump up other inflatables you might have in your home, like a ball, bicycle tire, kiddie pool or inflatable pool toys. Air mattresses with built-in pumps are great because there is no chance of the hassle of losing adapters or the pump itself. Some models even offer adjustable comfort levels that can be easily set to plush, medium or firm with the turn of a knob. Almost every model with a built-in pump can be turned on and then ignored because they will automatically stop inflating when full. This is great because it gives you time back to do other things while the airbed inflates. Because internal pumps use electricity or battery power they will also typically inflate much faster than those with external pumps. In addition, many of the best blow up mattresses with built-in pumps also come with automatic deflate, so you will no longer have to roll on the surface or use any other crazy tricks to get the mattress to deflate faster after use. Due to the popularity and quality of these models, they are becoming more readily available for purchase in stores and on websites than those that require external pumps. 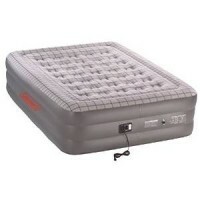 This top rated air mattress is a Queen size coming in at 58″ x 78″ x 19″. The raised height design and two separate inner chambers for adjustable comfort make this an excellent option for indoor use as a static, temporary or guest bed. This luxury air mattress features 40 internal air coils, which add support and durability to help you get a great night of rest. 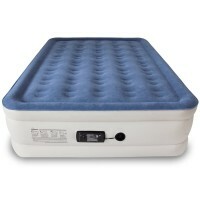 It also features a sure-grip bottom to prevent the airbed from sliding around as you move. The 1-click internal pump makes inflating and deflating very quick and straightforward; in fact, it can reach full size in less than four minutes. This is our favorite of the electric inflatable mattresses we have reviewed and is also widely considered to be the best air mattress amongst verified owners. The SoundAsleep Dream Series Queen is full of amazing features, is built with high-quality materials, and comes at an affordable price, to get you plenty of bang for your buck. Another excellent air mattress that we love is the 18″ high Serta Raised with neverFLAT technology from one of the world’s number one bedding companies. This prevalent model comes packed with 35 circular coils and horizontal reinforcements for comfort. It is available in two of the most common US mattress sizes, which are Twin (74″ x 39″) and Queen (80″ x 60″). There are two built-in pumps, one to inflate or deflate and the other to maintain the proper air pressure while you sleep to keep your airbed at the optimal setting for your comfort and increase safety. When inflating, choose from plush, medium, or firm options and walk away. You will come back to find a perfectly inflated blow up mattress for your slumber needs. Finally, this model comes with a carry bag to make storage and travel easier than ever. If you’re after a product from a company name you know you can trust, this might be the best air bed for you. This air bed from Intex is currently causing quite a stir and for a good reason too. Raised to a generous 22″, it is higher than most other raised air beds. It duplicates a traditional bed in height and comfort, with the added benefits of mobility and lower cost. Because of the size of this inflatable bed, it easily fits a queen fitted sheet comfortably without bunching or slipping like many others. With the built-in, high-powered, electric pump you can quickly inflate the Comfort Plush Elevated Dura Beam air bed to full size within three to five minutes, and you can adjust the firmness level with the touch of a button. 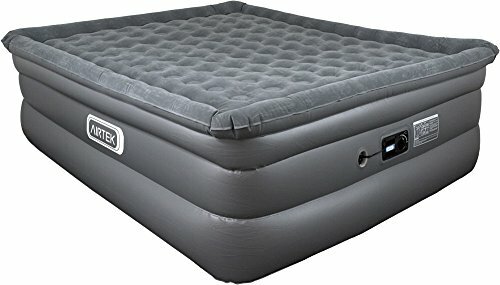 Unfortunately, this air bed only comes in Queen size (60 x 80 x 22), but at such a low price point it is still a great choice as long as space permits. The high-quality materials used to build this one means it will hang on for years to come, and likely never need to be replaced, just making it an even better value. 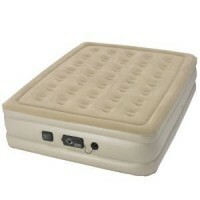 Another favorite available in both Queen and Twin size is the Raised Air Mattress with Never Flat Pump by Insta-Bed. It is raised to 18 inches, which makes getting in and out easy. Circular coils and horizontal reinforcements create an extra comfortable sleeping experience for you with this mattress, and the flocked top helps to keep bedding in place even as you move around on the bed. Harnessed with a very powerful yet whisper quiet internal AC pump, it inflates and deflates very quickly, and also allows for adjustable firmness selection in the form of Plush, Medium, or Firm. Never Flat technology keeps the bed at your level of firmness all night by adjusting air pressure quickly and quietly throughout the night as needed. Once the sheets are on, you’ll never be able to tell the difference between this air mattress and a quality innerspring. For an inexpensive, electrically inflatable air mattress, this ticks all the boxes. 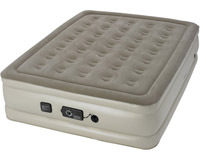 This air bed is a top-rated, lightweight and compact product from a leading manufacturer. Available in both Twin and Queen, it’s just slightly shorter than an average raised airbed at just 16.5” high, but features a built-in pillow for added comfort. The Intex features a flocked top to help keep sheets in place and is also waterproof, so you can easily bring it camping without worrying about damage from rain or dew. For such a compact and low-cost blow up bed, this Intex Pillow Rest model has a surprisingly high-powered internal pump that can inflate to full size in approximately 3 minutes. The bed is made of high-quality polyester fibers that will not stretch over time, making this heavy duty and ultra-durable for years of usage. If you’re on a tight budget and after something that does the job with a few added comforts, this possibly might be the best inflatable bed for you. This low-profile air mattress is made especially for those who love camping and sleeping on a little luxury at the same time. 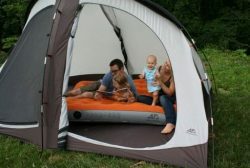 The high-quality, eco-friendly PVC used to create this camping mattress was used with the outdoors in mind. It is tough enough to withstand a night on the rocks so you can sleep comfortably no matter your location. The product comes with an external pump with a rechargeable battery. The battery can be charged ahead of your trip, and then recharged in your car on the road. It will inflate the Queen size camping air mattress in less than three minutes, and since the pump is external, it can also be used on any other inflatables you brought on your adventure. The only downside to this highly portable mattress is its inability to be used every day in the home as a permanent solution. However, if you are looking for a quality mattress for camping trips or even quick setup and easy storage in a small apartment or home, this is definitely one to consider. The Classic air mattress by AeroBed comes in both Queen and Twin size. It has a low profile design, so it’s incredibly lightweight and compact. The oval coils on this bed offer added comfort for great sleep. 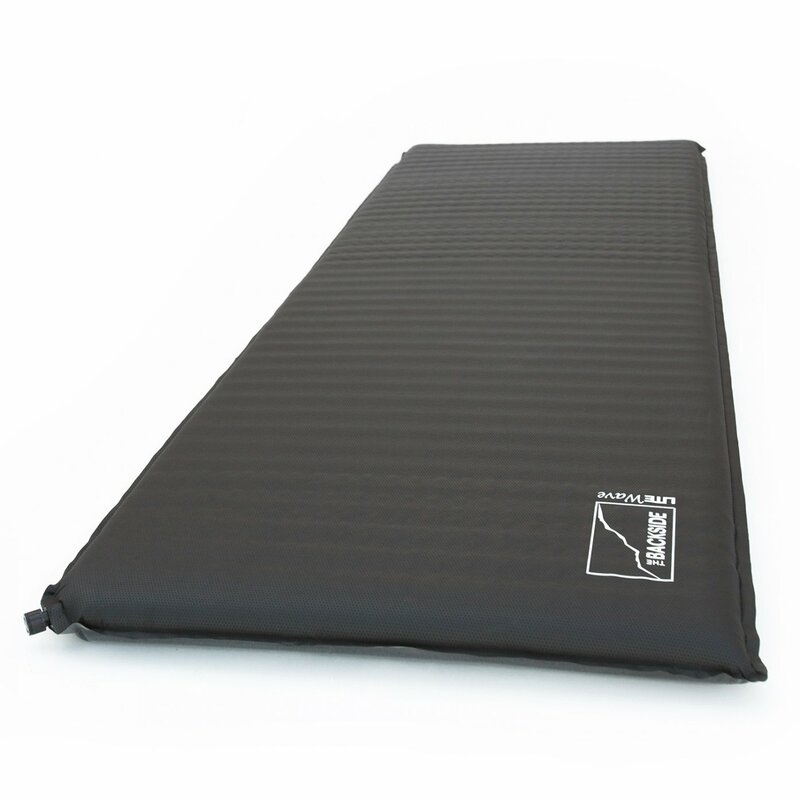 The Classic serves as an ideal camping mattress or for temporary in-home or guest usage. Like the camping series model above, it is perfect for short-term use only and should not be utilized as a permanent bed in your home. The AeroBed comes with an external pump for quick and easy inflation. The pump is an excellent device that inflates the airbed to full size in less than five minutes. This is an inexpensive yet sturdy and well-built product that will keep you or your guests comfortable all night long. It supports up to 600lbs of weight at a time, so it is perfect for partners to share. 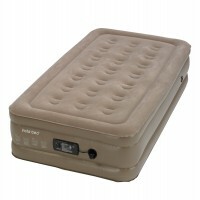 A Coleman air bed is something that you should experience at least once in your life. These less-expensive inflatable alternatives to conventional mattresses are some of the best on the market. The latest Queen from Coleman’s QuickBed series is the Premium SupportRest. 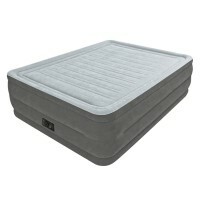 It is 18” high and features a soft suede top that keeps you comfortable while also keeping your bedding in place. This blow up bed also features 35 coils for support and stability as you sleep. Unlike others, this air bed only has one 120v built-in electric pump, so although it inflates quickly and has a double lock valve to keep air in, any air lost overnight will not automatically refill. This bed is perfect for guests due to its compact storage size and with a lightweight design, but it should not be used outdoors since it was created for indoor use only. The heavy duty inflatable mattress by Sleep Restoration has been taking the market by storm in recent months. This is not just a comfy air mattress for guests, but also an extremely satisfactory Queen size for those who would like to use it on a more permanent basis for regular nightly slumber. It claims to be puncture-resistant due to the extra thick materials and comes with a repair kit just in case of wear and tear. It is double-height and has a flocked top and coil system for extra comfort, which evenly distributes weight across the mattress. The built-in air pump inflates it with the flip of a switch and automatically deflates as well. Sleep restoration includes an oversized carry bag for quick and easy travel and storage and added convenience. Finally, at just 17lbs it is one of the lighter of those on our list, making it an excellent mattress for camping and travel. Weighing only 11lbs, yet capable of supporting up to 600lbs of weight, the Intex Classic Downy is a low profile Queen size airbed that allows for a snug fit for your fitted sheets. This multi-purpose model can be used both indoors and out since it fits easily into most tents and can be folded compactly when finished for storage. It comes with two inflatable pillows so you will never have to worry about forgetting a pillow when traveling. The downside is the external manual hand pump. Manual pumps are not the most convenient option, but they are lighter weight than most pumps, so they are ideal for backcountry outings or for use with other inflatable objects. The flocked top is a cozy surface, which can also be cleaned very easily. Overall, we think it is the best air mattress for camping on our list. We also love the great value it brings. It has the luxury and elegance to be used in-home as well, so do not discount this product for non-camping related activities. We think you’ll love using this one for all occasions. It certainly gets a thumbs-up from us. As always we struggled to choose just one of the 10 reviewed, so we’ll start by discussing the top two from our updated air mattress reviews for 2019. The SoundAsleep Dream Series air mattress is the best rated among owners for comfort, build quality, back support and affordability. We agree, and that’s why it receives a high rating. 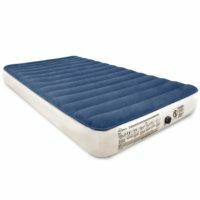 It would have rated 5 stars but because it requires a mains/electrical source for the pump it isn’t considered the best camping mattress, but great for indoor use. The Intex Classic Downy is a top-rated product that serves a multipurpose design and has all the qualities and perks of the above, but additionally has the advantage of potentially being used as an outdoor mattress if you require. It can quickly be inflated using the supplied hand pump, or you can buy a charger and use via a regular home outlet. The only thing we wish for was that it could be made available in smaller custom sizes like other sleeping pads. In short, no matter what your requirements there is a model out there to suit everyone. What we consider as positives or negatives may not be as relevant to your needs, but hopefully, our mattress buying guide has given some insight as to what to look out for whilst making your decision. Hi, do you have a thick Queen size mattress? I’m wanting one as high as a lounge suit as it is easier for me to get out of bed due to my arthritis. Thank you so much.